Your furnace is quite possibly one of the most important parts of your home – especially for those of us who live here in the North Pole Canada… I mean Canada. Despite this, most homeowners know a whole lot of nothing about their furnace, other than that it keeps them warm and it’s expensive to replace if anything happens to it. So to help you be the best homeowner you can be (and save yourself some inevitable hassle and money down the road) we are going to let you in on 3 things you really should know about your furnace. Of course, this is an average estimate – depending on multiple factors, a typical furnace can last anywhere from 15 to 30 (or even more) years. However, most manufacturers recommend having your furnace replaced after 20 years. What Can Affect My Furnace’s Longevity? Some of the factors that can influence how long your furnace lasts for include: the make and model of the unit, the frequency and quality of maintenance, moisture levels and proper ventilation, and even whether or not it was installed properly. How Will I Know When To Replace My Furnace? This is a broad question – there is no one correct answer. Of course, if you are already having troubles with your furnace or it stops working all together – and it is already over 15 years old – you are more than likely better off replacing the unit than repairing it. In another sense, if the furnace is over 15 years old and you aren’t experiencing any problems, you may still be better off replacing it, as a new furnace will be more efficient. This will more than pay for itself by saving you money in the long run on fuel and operating costs (as well as potential repairs) that you may run into with an older, less efficient furnace. If you really aren’t sure which option would be better for you, your home, and your wallet – have a technician come and inspect your furnace. They can let you know what they think, based on experience and education on the matter, and can help you make a more informed decision. Your furnace produces heat when it discharges exhaust gases, which flow through the vent pipes from the unit to the exterior of your home. If these vent pipes are too close to anything – such as the wall, other utility units, or even just random objects you are storing in the area – you may have a problem on your hands. When this problem becomes very serious is when the objects close to the vent pipes are combustible. If these objects are too near to the vent pipes, the heat released from them can, after a period of time, be enough to cause the combustible objects to ignite. Of course, for safety’s sake, there are required minimum vent pipe clearances that need to be met when your furnace is installed – so it is important that you are aware of this and can discuss these requirements with your installation technician. 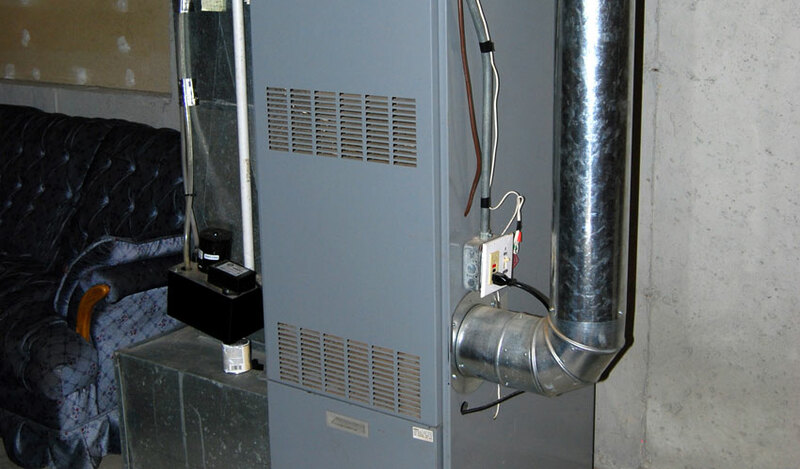 As we mentioned earlier, the frequency and quality of maintenance can have a large impact on your furnace’s longevity. It is recommended that you have your furnace inspected (at least) once per year – preferably in the fall season, giving yourself time to allow for any necessary repairs you may need before the colder weather hits. During this inspection, once of the most important things to check for is leaks, especially in the flue pipe, as carbon monoxide leaking into your home can be very dangerous. Along with an inspection you should also have your furnace cleaned every year as well. Not only should you ensure you have a clean air filter for the upcoming season, but you also should have the inside of the unit itself cleaned. When air mixes with fuel in the furnace’s combustion chamber it generates heat, water vapour, soot, and carbon dioxide. All of these, especially together, can cause corrosion within your furnace. By keeping up with the cleaning and inspections, your furnace will be in tip top shape for the cold, long winter (sigh) ahead. Can you think of any other important things that homeowners should know about their furnaces? Share them below!